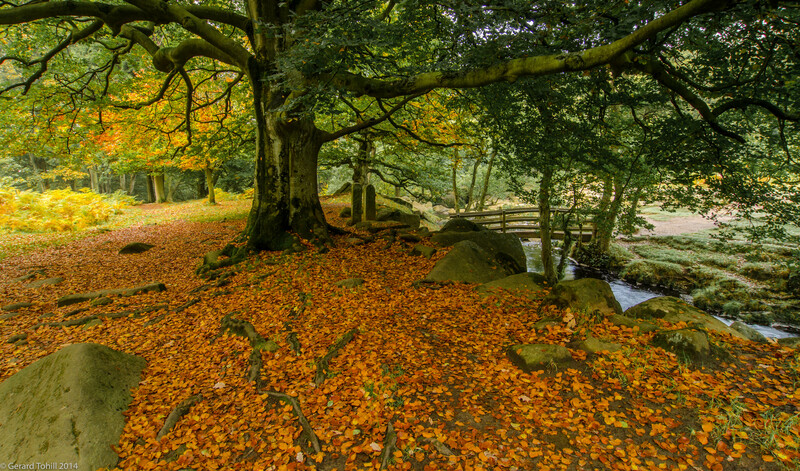 Whilst in the Peak District, I headed over to Padley Wood, where I was confident there would be many opportunities for a nice autumn scene. This carpet of leaves was begging to be photographed. The hard part was the composition, along with the contrast between the bright background and the deep shadows under the trees. In these circumstances, I expose for the highlights, and trust my camera can capture enough shadow detail that I can draw out in post processing. I usually take a few backup shots at different exposures – it gives me the option of choosing the best shot from the computer screen, rather than the camera LCD. Photography stuff: 12-24mm lens at 12mm, 0.4 sec at f/10 (shows how low the light was), 2 stop soft graduated ND filter, tripod, remote release. I’d say you chose perfectly. A beautiful autumn scene! Thank you. Padley Wood and gorge is a great place to take photographs – you can’t really go wrong there! Excellent detail, did you have to use high ISO for the photo? I see you used small aperture. Thank you. I used a tripod, so I could set ISO to 100 (which is the ISO setting I try to use by default). Tripod is the good solution, thank you.